Within the reFUEL project, one aim is to bio-physically simulate electric and solar fuel production. 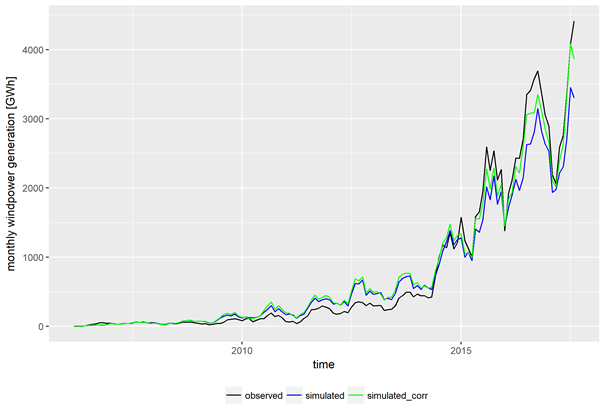 For this purpose, we use climate timeseries for simulation. While they are readily available in reanalysis datasets, bias-correction is often necessary to make them applicable to the specific regional context. In this master thesis, I have developed a bias-correction approach for the case of Brazil and applied the resulting dataset to a practically relevant research question: in recent years, wind power generation in Brazil has experienced a significant boom – as a result of increasing electricity demand, and as it can very well balance seasonal and inter-annual variability from hydropower generation, the biggest source of electricity in Brazil. Being able to better predict power generation from wind power plants on a seasonal level allows for an improved operation of large hydropower reservoirs. We therefore assessed, if El Niño and La Niña events can be used as indicators for future wind power generation. For that purpose, very long timeseries of windpower generation are necessary – however, they are not available as the first wind power plants were built in Brazil starting in 2006. Long timeseries of several decades therefore have to be simulated from climate data. We use wind speed data provided by the NASA, the MERRA-2 Reanalysis data, for this purpose. Reanalysis data are consistent climate timeseries derived from satellite and earth observation data and are available globally. While the data are consistent, local bias may remain in the datasets as a result of coarse spatial resolution of the underlying models. We therefore apply two types of bias correction to improve the modelling results. In the first correction step, wind speeds are corrected with the help of measured wind speeds from several meteorological stations throughout Brazil. In the second step, wind power generation time series from the national grid operator of Brazil are used to correct wind power. As power generation data are available for the states, wind power correction is performed on that level of spatial disaggregation. For the simulation of wind power and subsequent wind speed bias correction, different methods are tested and the method with highest fit to historical generation is selected for comparison to time series of El Niño and La Niña events. Results show that especially wind power correction has a positive effect on the quality of the simulation. The impact of wind speed correction is lower, but still affects results in a positive way, in particular in the North-East of Brazil. The analysis of correlations with El Niño and La Niña indices does not show clear results. In some regions an event has impacts on wind power generation after one to three months, in others after five to eight. The influence of El Niño is in general higher than that of La Niña or if both events are combined. In some regions a positive impact is observed: if a strong El Niño or La Niña event occurs, wind speeds are higher and thus wind power generation too. In other regions, however, the impact is negative. The thesis, code, and data can be downloaded here. Should district heating system owners embrace higher emission prices?